Relive your college days with our set of 4 personalized Collegiate icon pint glasses. 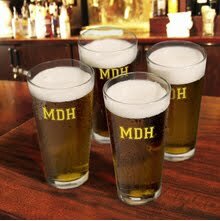 Just right for your favorite brew, soft drink or other beverage, these personalized pint glasses feature a collegiate-style screen printed monogram in a choice of styles. One or more sets make a handsome addition to your home bar and keep the gang coming back for more! Holds 16 oz. Selection options for initial design and ink color (all four glasses will be identical).